As Labor Day approaches, and as we all take a long holiday weekend in remembrance of the hard work that went into building our beloved country, many of us are also deciding which epic massive to attend. If you’re going to be near Atlanta, Georgia, the choice isn’t too difficult. Iris Presents (Voted Atlanta’s number one promoter 2 years running) delivers with their inaugural edition of Imagine Music Festival boasting a stacked line-up over 2 days. The festival will cover over 17 acres, combining Historic Fourth Ward Park, Masquerade Music Park, and Clear Lake Basin creating a beautiful one-of-a-kind outdoor venue. World class sound and lightning, roaming cirque style performers, creeks and ponds will get your imagination flowing to the musically diverse lineup. Headlining the festival will be Fedde Le Grand, Adventure Club, Destroid (Excision, Downlink and KJ Sawka) joined by Rusko, Infected Mushroom (DJ Set), Pretty Lights Music Label Block with Michal Menert and Supervision, Beats Antique, Shpongle, RJD2 and many, many more. For the ultimate festival experience check out Imagine Festival’s VIP options which will grant you access to three VIP lounges, perfect views of the main stage, front-row pit access, FREE food, bottle service, separate entrance, air-conditioned lounge and bathrooms, as well as the opportunity to mix and mingle with the talent and more. Atlanta party people will be in for quite the treat this coming holiday weekend. Dancing on an absolutely beautiful festival grounds to a ridiculously stacked line-up with mind blowing lighting and sound joined all together create a 360 degree immersive experience guaranteed to open anyone’s mind and let the imagination flow! 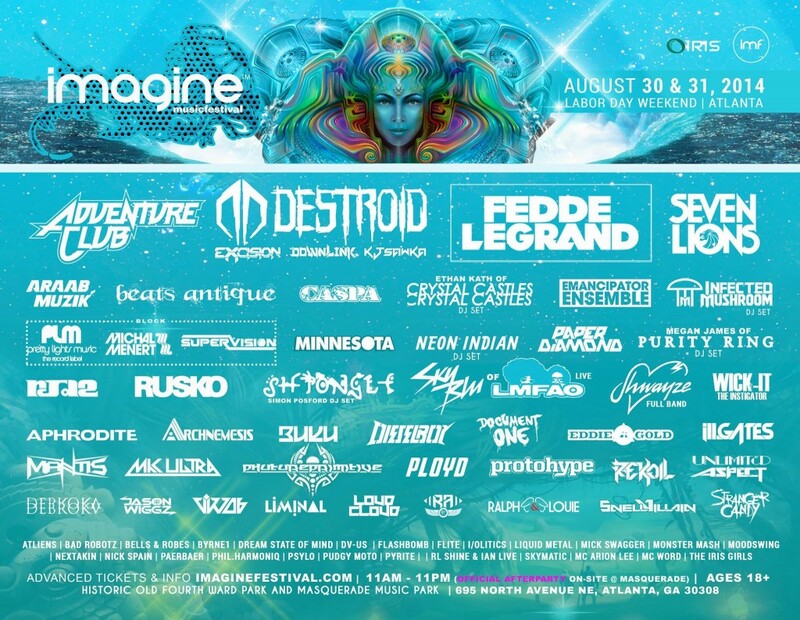 For more info visit www.imaginemusicfestival.com.